The Building and Construction Law Journal (ISSN: 0815-6050) provides an arena for the debate of relevant changes in building and construction law at both a national and international level. 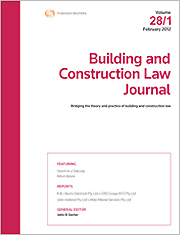 This journal provides an update on legislative change, as well as debate and analysis on building and construction claims, disputes, contracts and court decisions. Every issue of the journal covers core subject-areas plus specially headnoted multi-jurisdictional building and construction law reports. Michael Christie SC was admitted to the Bar in 1991. He is a graduate of Sydney and Oxford Universities and was formerly a part-time Lecturer at Sydney University Law School. He worked professionally with the former General Editor, the late John Dorter, over many years. More recently, he assisted Mr Dorter in relation to the journal and has been acting editor. The consolidated table of authors and articles for this Journal, is available here. In Grenfell’s wake. Building safer high-rises?